Of the many the things to do in Mayo, walking is one of the most popular, and for good reason. The views you’ll get of the unspoilt countryside are breathtaking and the invigorating pure sea air direct from the Atlantic is an added bonus. A huge community effort in recent years has developed a very wide variety of marked trails within easy reach of Westport. Care has been taken to build trails with everyone in mind, from families with children to adventure sports enthusiasts. The trails range from short strolls around Westport town and the Westport Greenway to walks on spectacular Blue Flag and Green Coast beaches, loop walks by the sea, in the hills and in the wood and forests around Clew Bay, to the spectacular Great Western Greenway and the more adventurous long-distance walks of the Western Way, Bangor Trail and Tóchar Phádraig. Brackloon Wood which is a native oak forest is just a five minute drive from Acorn Wood Glamping. Click for more information. 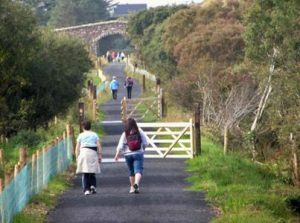 The world class Great Western Greenway is the longest off-raod walking and cycling trail in Ireland. This 42km trail is traffic free and follows the route of the renowned Westport to Achill Railway which closed in 1937.